Looking west from Rocky Point at the ten-mile long Courtney Campbell Causeway between Clearwater and Tampa. Photo taken October 19, 2013. Florida 60 is a 160.82 mile long trans-peninsular route that connects Clearwater to the west with Vero Beach in the east. 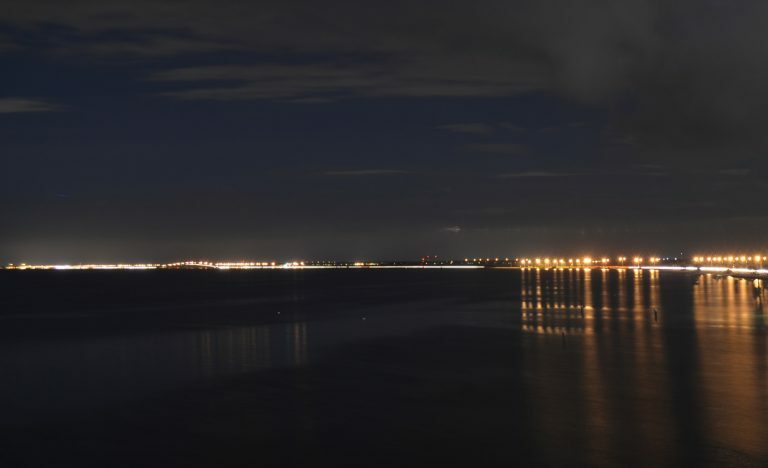 The state road is mostly four lanes, traveling across Old Tampa Bay via Courtney Campbell Causeway between urban Pinellas County and Hillsborough County, and Kennedy Boulevard through the city of Tampa. A short overlap with U.S. 41 Business takes the state road through Downtown Tampa to Adamo Drive, an industrial arterial parallel to the Selmon Expressway (SR 618) east to Brandon. Through Brandon, SR 60 comprises a busy arterial with up to eight lanes of capacity. As the main route through the unincorporated suburb, the route is extremely busy. East from the county line, SR 60 drops southward to Mulberry and Bartow, where it utilizes a bypass along side a portion of U.S. 98. Beyond the Polk County seat, SR 60 becomes more rural to Lake Wales. Once at Lake Wales, Florida 60 shifts southward to bypass the city center from a folded diamond interchange with U.S. 27 to the south of Lake Wales itself. The remainder of the highway southeast to Avon Park Bombing Range and Yeehaw Junction (where it meets both U.S. 441 and Florida's Turnpike) is rural. It is not until Vero Beach and the interchange with I-95 that SR 60 again transitions to a commercial arterial. The state road bee lines east toward Downtown Vero Beach, where it separates into a one-way couplet before taking a dog leg north and east across the Indian River to end at Florida A1A, 0.3 miles from the Atlantic Ocean beaches. An unsigned branch of SR 60 lines West Kennedy Boulevard from Hoover Boulevard and Memorial Highway at Westshore in Tampa. The 0.311 mile segment connects the ramps with I-275 at the Howard Frankland Bridge approach with the SR 60 mainline transition from the Memorial Highway freeway to Kennedy Boulevard. Looking east at Rocky Point and the skyline of Downtown Tampa from Ben T. Davis Municipal Beach along the south side of Courtney Campbell Causeway. Photo taken 01/02/06. Narrow frontage roads line the north side of Courtney Campbell Causeway as it treks across Old Tampa Bay. These roads provide a place to pull off in addition to beach and fishing access. This view looks at the navigation channel bridge along SR 60. Photos taken 01/02/06. Looking southeast from Ben T. Davis Municipal Beach at the distant Howard Frankland Bridge carrying Interstate 275 between Westshore in Tampa and Feather Sound in St. Petersburg. Photo taken 01/02/06. Kennedy Boulevard begins at the wye interchange (Exit 39) from Interstate 275 north. The four-lane boulevard intersects Hoover Boulevard, a local road south to several condominium and office complexes, immediately beyond the freeway off-ramp. Photo taken 01/18/14. A short distance further, Kennedy Boulevard approaches Florida 60 at the south end of the Memorial Highway freeway. Photo taken 01/18/14. SR 60 west passes under adjacent Interstate 275 en route to George J. Bean Parkway north to TPA International Airport and the Veterans Expressway (SR 589). Photo taken 01/18/14. Florida 60 east overtakes Kennedy Boulevard from the entrance to Westshore Mall here to Downtown Tampa. Photo taken 01/18/14. Motorists taking Kennedy Boulevard (SR 60) west directly to I-275 south are alerted to the length of the Howard Frankland Bridge spanning Old Tampa Bay. Photo taken 04/17/16. A trailblazer for I-275 south stands along Kennedy Boulevard westbound between O'Brien Street and Hoover Boulevard by the Beach Park community. Photo taken 04/17/16. Hoover Boulevard links Kennedy Boulevard south with Cleveland and Azeele Streets in Beach Park. Photo taken 04/17/16. Kennedy Boulevard defaults onto Interstate 275 south at a wye interchange beyond Hoover Boulevard. Photo taken 04/17/16. Cleveland Street (former Florida 60) eastbound at East Avenue and a CSX Railroad line in Downtown Clearwater. Cleveland Street carried Florida 60 east from the original Memorial Causeway Bridge to Gulf to Bay Boulevard until 2005. Photo taken 01/02/06. Eastbound Cleveland Street at Myrtle Street (U.S. 19 Alternate) prior to a streetscaping project. U.S. 19 Alternate was relocated from Fort Harrison Avenue to Myrtle Street in 2007. The US highway travels south to a short overlap with Florida 60 (Court / Chestnut Streets) east to Missouri Avenue. Photo taken 01/02/06. Cleveland Street at Martin Luther King, Jr. Avenue east of Downtown Clearwater. The transition from state to city maintenance resulted in a redesign of Cleveland Street from a four-lane arterial to two-lane, tree-lined boulevard. Photo taken 01/02/06. Missouri Avenue leads north to Florida 590 (Drew Street) and south to the U.S. 19 Alternate and Florida 60 split at Court Street. U.S. 19 Alternate follows Missouri Avenue (Florida 651) south to Florida 686. Cleveland Street now expands to four lanes east of Missouri Avenue. Photo taken 01/02/06. Cleveland Street nears its split with Gulf to Bay Boulevard (former Florida 60) at Evergreen Avenue. Cleveland Street continues east to Highland Avenue with four lanes. The connection provides an alternate to Florida 590 (Drew Street), three blocks to the north. Photo taken 01/02/06. This overhead directed Florida 60 southeast from Cleveland Street onto Gulf to Bay Boulevard. It was removed by 2007 as part of a signal upgrade project. Photo taken 01/02/06. Gulf to Bay Boulevard (former Florida 60) angles southeast to become a part of Florida 60 at Court Street and Highland Avenue. Court Street west to Missouri Avenue was formerly a part of Florida 651, the hidden counterpart to U.S. 19 Alternate leading south to Seminole. This assembly was replaced by 2007 to reflect SR 60 instead of SR 651. Photo taken 01/02/06. A five way intersection joins Gulf to Bay Boulevard with Court Street west (former SR 651) and Highland Avenue north and south. SR 60 follows Gulf to Bay Boulevard east from Court Street between Highland Avenue and Courtney Campbell Causeway. Photo taken 01/02/06. Historical look at Cleveland Street west at Fort Harrison Avenue in Downtown Clearwater. Much has changed in this scene, with the shield assembly for U.S. 19 Alternate and SR 60 removed, a tree lined median added and a new high rise constructed along the horizon. Florida 60 formerly followed Cleveland Street, but now follows Court Street westbound to a new Memorial Causeway bridge over the Intracoastal Waterway, four blocks to the south. U.S. 19 Alternate was relocated in 2007 three blocks to the east, leading to the removal of this sign array. Photo taken 01/02/06. "Pinellas Bridges and Causeways." Bayciti - Tampa Bay Urban Blog. Cozart, Justin, April 8, 2005. September 18, 2015. "Open at Last." St. Petersburg Times, August 18, 2005. "Bridges (Hillsborough)." Bayciti - Tampa Bay Urban Blog. Cozart, Justin, October 24, 2004. September 18, 2015.